SeaTac’s Proposition 1 has passed! This proposition will bring living wages, paid sick leave and the right to organize to over 6000 airport workers at the Sea-Tac Airport. It was a hard fought election that garnered National and International news attention. SeaTac, WA – Twenty leading Democrats including U.S. Representative Adam Smith, King County Executive Dow Constantine, King County Councilmember Julia Patterson, and State Senator Karen Keiser are announcing their strong support and endorsement of SeaTac Proposition 1, on this fall’s election ballot. The Speaker of the State House, Frank Chopp, and the State Democrats, King County Democrats and the 33rd District Democrats also endorsed SeaTac Proposition 1. SeaTac – July 19, 2013: SeaTac voters and airport workers say they are not surprised Alaska Airlines and the Washington Restaurant Association failed their legal attempt to block the SeaTac City Council from sending the Good Jobs Initiative to voters later this fall. Voters and community leaders continue to question the corporations’ motivation in blocking a popular citizen initiative that will give workers in and around the airport the opportunity to make ends meet and get ahead. Alaska Airlines and the Washington Restaurant Association tried to prevent SeaTac voters from voicing their opinions on a popular voter-backed initiative to bring good jobs to SeaTac Airport and related hospitality industries. Alaska Airlines and the Washington Restaurant Association, represented by corporate law firm Davis, Wright, Tremaine, filed their demands last week. SeaTac – July 15, 2013: SeaTac voters and airport worker supporters reacted sharply to the news that Alaska Airlines and the Washington Restaurant Association have filed a lawsuit seeking to block the SeaTac City Council from sending the Good Jobs Initiative to voters later this fall. Voters and community leaders question the corporations’ motivation in blocking a popular citizen initiative that will give workers in and around the airport the opportunity to make ends meet and get ahead. 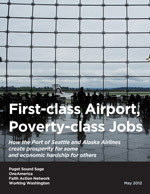 SeaTac, May 14 – Airport workers and community allies are moving forward on a voter initiative to improve the jobs of thousands of low-wage workers in and around SeaTac Airport. More than 90 volunteers came out last Saturday to gather signatures. The Committee expects to gather enough signatures to qualify to get the measure qualified for presentation to the City Council, and for inclusion on the November 2013 ballot in the coming weeks. A broad array of workers, faith and community supporters, union members and retirees are part of the SeaTac Committee for Good Jobs. Working Washington is also part of the Committee.